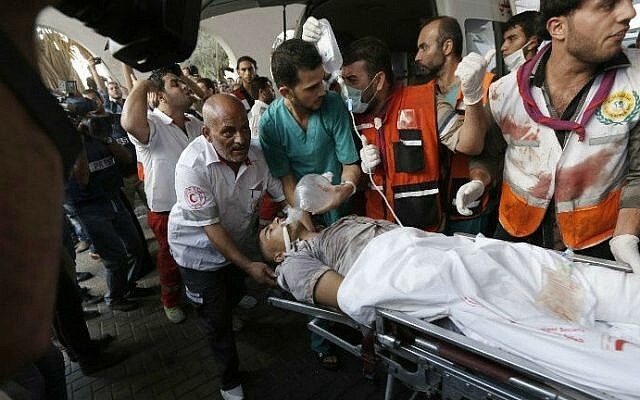 Palestinian officials said at least 17 people were killed Wednesday when Israel fired on a packed Gaza market Wednesday. Thick black smoke billowed over the site in the war-torn Shejaiya neighborhood as at least five ambulances raced to the scene where bodies lay strewn on the ground, an AFP correspondent said. 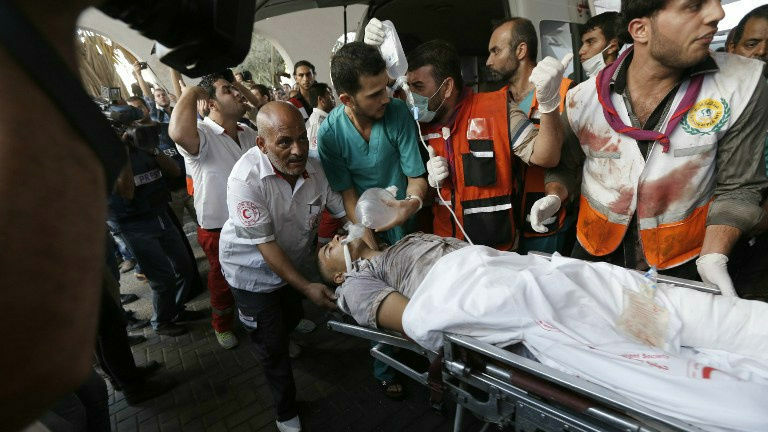 Over 200 were wounded, medics in Gaza said. Israel had said that a humanitarian truce declared a few hours earlier would not apply in places where troops were “currently operating.” Before the truce came into effect, the IDF had issued a specific warning to the residents of Shejaiya that the neighborhood would be targeted, Ynet reported. Rockets were reportedly launched at Israel from an area near the neighborhood before the Israeli strike. The strike on the market came hours after Israeli tank shells hit a school sheltering more than 3,000 homeless people, killing 16 and drawing a furious response from the UN agency for Palestinian refugees (UNRWA). Israel said the shells were fired at the school after mortar shells were fired on its forces by Gazan operatives from there. “I condemn in the strongest possible terms this serious violation of international law by Israeli forces,” UNRWA Commissioner General Pierre Krahenbuhl said, indicating that the school’s location in the Jabaliya camp had been communicated to the Israeli army 17 times. Israeli tank shelling and airstrikes killed at least 100 Palestinians and wounded hundreds on Wednesday, Palestinian medics said, sending the death toll from 23 days of Israeli attacks soaring above 1,300. An IDF spokesman said Wednesday that “many hundreds” of Hamas gunmen were among the dead. “They’re bombing houses, homes, schools — there’s no protection,” said Moin al-Athamna, one of those who had been staying at the Jabaliya school when the attack occurred. Meanwhile, the army said three troops had been killed in Gaza, raising the overall number of soldiers killed to 56 since the operation began on July 8 in an Israeli effort to end rocket fire from Gaza toward Israeli towns, and locate and destroy cross-border tunnels used by Hamas operatives to infiltrate into Israel. International efforts to end the bloody conflict have so far led nowhere, with current efforts focused on a top-level Palestinian delegation, including Hamas and Islamic Jihad leaders, which was expected in Cairo in the coming days to discuss a new truce proposal. An Israeli delegation was also headed for Cairo for talks on Wednesday. Palestinian Authority President Mahmoud Abbas had spoken to exiled Hamas chief Khaled Mashaal and proposed the 24-hour truce, which the Hamas chief had “agreed” to, senior official Nabil Shaath told AFP. But a Hamas spokesman denied agreeing to any new truce, saying they first wanted “an Israeli commitment,” and its military chief Muhammed Deif said there would be no ceasefire without Israel lifting its eight-year blockade on Gaza.